Organize the cables in your server rack or cabinet, by bundling them together using this cut-to-size hook-and-loop wrap. This 25 ft. roll of hook-and-loop cable tie makes it easy to keep your cables neat and tidy by binding them together or binding them to a structure. The self-gripping fabric can be cut to any size and is 3/4 in. (19 mm) wide, which offers a slim wrap-around solution for any computer, appliance or electronics cable, in virtually any environment.This roll of cable tie offers a quick and easy solution for bundling cables together and securing your cables for better routing. Properly routed cables help protect your equipment, by reducing cable tension and preventing excessive heat caused by unorganized cables restricting airflow.It uses a hook-and-loop fastening method to ensure a sturdy grip that's easy to apply. With the hook mechanism on one side of the tape and a loop mechanism on the other, you can easily wrap it around your cable bundle, and fasten the cable tie by draping it over itself.Whether your bundle consists of two small-gauge cables or many large-gauge cables, you can rest assured this roll of cable tie will handle it perfectly. 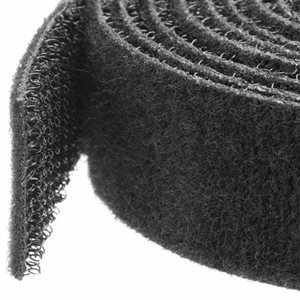 You can cut the hook-and-loop fabric to size using household scissors, meaning you can choose the perfect length for your specific application.The versatility of the cable tie makes the roll the ideal tool for you to keep on hand in your office, server room or industrial environment.While the most common use for this hook-and-loop fabric is binding and routing cables, you can also use it for other materials in your IT environment such as tools or raceways. The ties are easy to remove, reusable and adjustable, avoiding the hassle and waste of traditional zip ties.